My approach this year will not be to make bold resolutions that are absolutely unattainable even with the best dose of will power. Instead this year, I have decided to make 2014 New Year’s goals. Small but effective changes I feel will add up to my larger goal of being a better version of me in 2014. First step (smaller goal) is to find healthy choices I love. Foods that are so good, I forget they are healthy. Often healthy choices feel like punishment, but I want to find the ones that feel like a reward. I like kale, but have never mastered the art of a kale salad at home. I decided I would start my year off by learning to make a kale salad that wasn’t grassy or fibrous, but rather sweet and delicate. Below is a recipe for a bright, full of flavor kale salad. 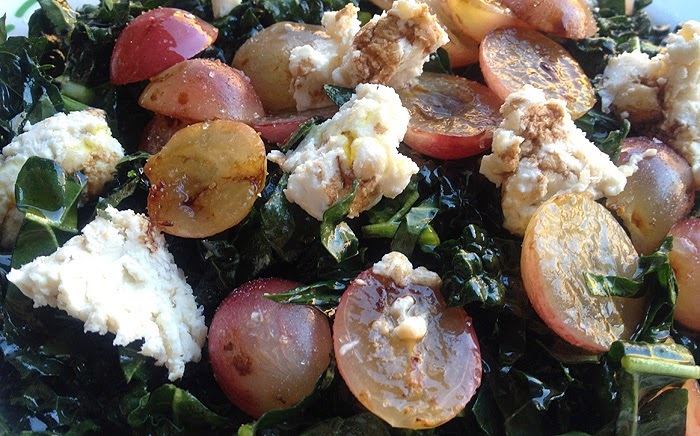 Warming the grapes turns them from sweet to savory and is a great complement to the tart goat cheese and kale. If this is your first attempt at kale, please pay attention to how the kale is prepared, with proper preparation, kale is sweet and delicious. Remove the ribs from the leaves of kale, then slice or chiffonade the kale into small pieces. Place kale in a large bowl and toss in 2 tablespoons of extra virgin olive oil and lightly salt. Set aside and let sit for at least 15 minutes. (This step will help remove the kale’s natural wax coating and will better absorb the dressing). Heat a small amount of olive oil in the frying pan. Toss in the halved grapes and season with salt and pepper to taste. Fry until skin starts to separate from grape. Remove from pan and let cool. Add 2 tablespoon of balsamic vinegar to kale. Use your hands and massage in the vinegar. Be sure to cover all of the kale. Toss in goat cheese and grapes. Drizzle balsamic vinegar lightly over the top of salad and serve. Leah- Your recipe sounds delicious but I have a small bone to pick. Calling for "Goat Cheese" in a recipe is like calling for "Cow Cheese". There are hundreds of cheeses made form goats milk. I assume you probably mean "fresh goats milk cheese" (the type that is similar to cream cheese), probably crumbled into the salad before mixing - but am not sure. And by the way - the typical American mistake of calling that cheese "chèvre" (maybe to make it sound fancier) is wrong. "Chèvre" means "goat", not "goat cheese", in French. In French, the proper term would be "fromage de chèvre". Yum! I love kale salads and I must agree with you…kale and goat cheese were meant to go together ;). Good luck with your New Year's goals! I love kale salad but never knew how to make one. So glad that I do now!